Pretty uninspiring but it does give you some basic information. What we are going to do is create our own conky with a little colour/formatting and positioning to make it appear better on the desktop. I often have more than one conky running and each can have it’s own “refresh rate” so rarely changing information can go in a separate file to be refreshed less often saving your computer resources. This conky shows my cpu, memory and basic network information along with my fan speeds. This will refresh the displayed information every 1 second and can be set to fractions of a second but that would be too much for this conky. The next line states how many times conky will refresh, I leave this set to 0 which means to run forever. this next line sets the location I want it to be displayed. Now I set the minimum and maximum sizes for the conky, this is not always necessary as you can have conky resize to fit whatever data you are displaying but for this guide I will have my size static. By setting the minimum and maximum width to the same value I can be sure the conky will always be the same width, the height can be set to a minimum value but it will grow according to the data you put in the text area. 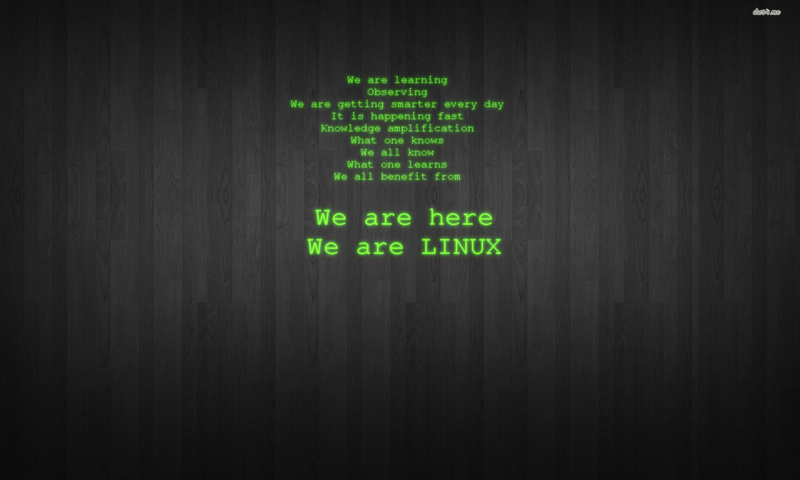 The next line is usually a requirement to prevent flickering of the conky and I always include it. 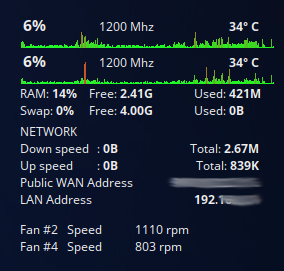 These next two lines can be set to give you a more averaged display of your cpu and network statistics, I prefer to read the current exact value but sometimes you might want the average of the last 2 or 3 readings, if this is what you want then set the value to the number of readings to average. These next group of lines allow you to set the window options. Now we set what we want as the default font and it’s size, you could also set if you want it to be bold etc. The next line set the display of sizes and speeds to a more human readable value, that is it will display as bytes, kilobytes, megabytes, gigabytes and probably terabytes too but I haven’t tested that as I only use my large devices for backups and all my working systems are 500Gb or less. And finally for this section I set the graph borders off, although when I am setting the visual layout I have them set to show (just put — at the beginning of the line to make it a comment) to allow me to precisely locate them where I want them to be. The last thing we must do for the config section is to close it, this is simply a matter of adding the closing parenthesis to match the one that started this section. There are many more options available to be entered here, but these are the ones I use most of the time. If you want to see some of the other options refer to the manual (man conky) which contains the full list with short explanations.